The authors apparently see poverty as a disease. On page 56 they ask: “how can we diagnose such a complex disease?” Later on the same page they refer to the “disease of poverty”. They say, “reconciling relationships is the essence of poverty alleviation” (130). Again, the book is filled with schemes and charts and diagrams but surprisingly, very little Scripture. Just imagine John Paton’s pastor saying this to him before he reached the shore of the New Hebrides, where the cannibals there had cooked and eaten two missionaries several years earlier: “A significant part of working in poor communities involves discovering and appreciating what God has been doing there for a long time! This should give us a sense of humility and awe as we enter poor communities, for part of what we see there reflects the very hand of God” (60). Corbett and Fikkert refuse to assert that there may be some people groups that are godless in every sphere of their society. This would imply inequality, which they are against. Were Jewish and Amalekite cultures equal? “If anyone dares suggest to me that the poor are poor because they are less spiritual than the rest of us—which is what the health and wealth gospel teaches—I am quick to rebuke them.” Mr. Corbett, is the poor lazy man in Proverbs 10:4 less spiritual than the wealthy hard worker of character? The general feeling I got from this book is that people are poor because of outsiders. The problem is without and not within. Now that is partially true. Jesus, the sinless man, was poor. Scripture speaks of poverty as a result of wicked resources and natural disasters. But there is also a wide swath of verses pointing to laziness, poor planning, deception, broken families and a host of other sins as the root of economic poverty. After living nearly a decade within a poor village, my conclusion has been that much of the poverty is due to an unbiblical worldview. Polygamy, sleeping around, and child grants to 16 year olds has pushed the HIV rate in Mbhokota to 50%. My unemployed neighbor got his teeth kicked in last week, but when I went to visit him his wife said he was back at the same bar where it happened. Roads are in disarray as the contractors use half the materials in order to pocket the rest. President Zuma has built himself a multimillion-dollar compound on taxpayer money. Instead, the authors rebuke churches with “god complexes” that are trying to help. I wrote “naïve” in the margin of the book over a dozen times. Because many of the authors’ conclusions were based off observations from short-term mission trips and slanted statistics, many of his comments made me roll my eyes. He said Africa will replace the United States as the center of Christianity in 2025. I live in Africa. They are as one African theologian said, “incurably religious”. But a deeper analysis tells us that the foundation of most churches is rotten to the core due to syncretism and the onslaught of the Prosperity Gospel. The authors tell us as story of a tall and muscular man crying because the missionaries did not teach him social justice (47). He paints most missionaries in the 20th century as only concerned with people’s souls but not interested in making disciples of all nations, later defined as no classes on business and farming. Another example of naivety came in the final chapter on Business as Missions (BAM), which represents businessmen businesspeople who want to establish corporations abroad to help the poor. Apparently, BAM “is as old as the New Testament” (216) and “finds its roots in the ministries of Paul, Aquila, and Priscilla, who used tent making as a means of supporting their missionary work” (215). The authors give four benefits to BAM and I would like to go through each one. (1) Gaining access to a closed country. This is a valid reason. When I visited the Comorian Islands, which is just a tiny Lilli pad of lava floating in the Indian Ocean, there is no chance of entering the country as a missionary. Evangelism and churches are illegal. NGOs appear to be the route many missionaries must take to gain access to the most closed countries in the world. (2) Providing the income needed for a ministry. This reason is surprising since this book is specifically addressed to North Americans. The authors have taken much of the book to show how Americans are the wealthiest people ever to live on planet earth. This indeed is an immense responsibility. We should be sending out church planters by the thousands. But I don’t see how getting an 8-4 job selling vacuums in Honduras is any different from the man who buried his talent in the ground. Weekly I tell my wife how thankful I am for the stateside churches whose generous giving allows us give all of our time to the ministry. According to 1 Corinthians 9, Paul The Tentmaker is the exception and Paul the Church Planter is the rule. (3) A natural context for relationships. The utopian view is that we manage a hardware shop where people come in to buy a pickaxe and instead sit down for an hour of evangelist and leave with a MacArthur Study Bible. But businessmen know that running a company well takes lots of time and headaches. So Paul said: “those who proclaim the gospel should get their living by the gospel” (1 Cor. 9:14). (4) Poverty alleviation. Here, the business is not a cover for the real thing. The business is the real thing—the missionary’s goal is the business itself to help the poor. If a family that moves to Ecuador for the primary purpose of giving employment to the poor are called “missionaries”, then the word has lost its meaning. Moreover, let me give an example of how BAM would need to start in our village. Take a year to get the proper paper work. Spend $7,000 for plane tickets and another few thousands to send your stuff. There are no places to rent in the village, so you’ll need to live outside of town until you can find a place to build a house. This will take a good year. In the mean time, take a couple of years to learn the language, since you won’t get far selling in English. Three years later, in a village of 60% unemployment, you get your hardware and agricultural plantation started. Most of your stock is stolen the first week…and I could go on and on. Would it be easier to do in the big city? Of course, but that is where the jobs are and then you’re not needed. The point: since working in a poor, destitute place is very difficult, put all of your time into gospel-centered work. 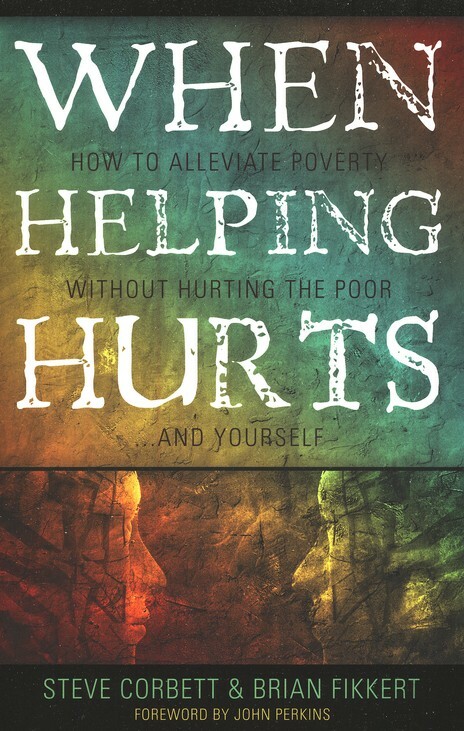 A sober review of When Helping Hurts is important because the book accurately presents how many evangelicals think about poverty. It is published by Moody, recommended by David Platt, and promoted in World Magazine—ministers and ministries for whom we cheer and pray. So a critique of the book is really a critique of the social ministry movement. The twenty recommendations are telling. Most are CEOs or presidents of colleges or para-church aid organizations. There are only three pastors and no missionaries, though this latter group would be most familiar with working alongside the poor. There are no recommendations from people living among the poor, only from those—including the authors—who are analyzing poverty from a distance. Three-week trips to Uganda don’t count. My comments here may carry some unusual weight for at least two reasons. First, if modern US statistics are accurate, the salary of my family and I may put us under the poverty line. I do not say this for sympathy; there is not a day in Africa we don’t feel rich. But this point is crucial because one of the arguments the authors’ imply is that rich Americans are to blame for much or the poverty in the world. Since I do not fit in this category, I’m safe from the charge. Second, I have something Corbett and Fikkert do not possess, something that cannot be bought or obtained in a short time: interaction and ministry among the world’s poor after the novelty of my western-ness and whiteness has worn off. I do not doubt that their conclusions after short-term visits with the poor are sincere and with conviction, but I deny those convictions would be the same had he lived with them for ten years. I reviewed this book back in 2012 and gave it a positive review. The authors should be commended for devoting an entire chapter to short-term missions (ch. 7), distinguishing between different kinds of poverty relief (p. 104) and acknowledging that not all poverty is created equal (ch. 4). Nonetheless, more experience on the field and a second run through of the book has changed my perspective. I’ll begin a brief series of posts with some concerns. Outside of chapter one, where they explore why Jesus came to earth, the authors reference Scripture only sixteen times in the remaining 180 pages, and only one passage is given any kind of explanation. The chapter on short-term missions didn’t reference a single verse. Money, Possessions, and Eternity this is not, where Randy Alcorn references that many Scriptures on a single page. What is the Mission of the Church? has 48 columns of texts in the Scripture index. The only passage that is given any kind of extended explanation is Colossians 1:19-20: “For in him all the fullness of God was pleased to dwell, and through him to reconcile to himself all things, whether on earth or in heaven, making peace by the blood of his cross.” Indeed, God in Christ has come to set everything right on earth, but this is his work alone. Paul is not imploring Christians to partner with God by addressing social problems. Directly before their definition of poverty alleviation, they then inconceivably reference 2 Corinthians 5:18-20. “All this is from God, who through Christ reconciled us to himself and gave us the ministry of reconciliation; that is, in Christ God was reconciling the world to himself, not counting their trespasses against them, and entrusting to us the message of reconciliation. Therefore, we are ambassadors for Christ, God making his appeal through us. We implore you on behalf of Christ, be reconciled to God.” Paul speaks of our “trespasses” (19) and the old things passing away (17) due—on the human level, to preachers persuading people (11) and on the divine level due to the work of Christ on the cross. While Paul makes no mention of material poverty alleviation, the authors make no mention of the cross or sin. They then quote passages from Isaiah 1 and Isaiah 58 where Judah is essentially on trial for their sins of injustice. The authors write: “translate this into the modern era, and we might say these folks were faithfully going to church each Sunday, attending midweek prayer meeting, going on the annual church retreat, and singing contemporary praise music. But God was disgusted with them, going so far as to call them ‘Sodom and Gomorrah’! Why was God so displeased? Both passages emphasize that God was furious over Israel’s failure to care for the poor and the oppressed.” (40) Is it true this passage is speaking of the faithful church attender who is not actively involved in social ministry? I agree that Christians should hate injustice and love to help the poor, but many of the author’s conclusions are built on the faulty premise that oppression and economic inequality are synonymous. God did not rebuke Israel because poor people existed but because the greedy and corrupt were stealing and taking bribes and profiting from the poor. “Everyone loves a bribe” (v.23). This is significant because if God wants us to be wise stewards of our money and if we are considering gearing a large portion of our time, effort, and finances toward social ministry and poverty alleviation, then we better know that this is what Scripture has commanded us to do. Helping is filled with bold, yet unproven assertions like that on page 46: “The Bible teaches that the local church must care for the both the spiritual and physical needs of the poor.” They gave far too little Scripture to substantiate such a claim. How does one judge circumstantial content if prophesy still exists today? Below, let me interact a little with some of Poythress’s arguments. [Judging] situations like these [is] not as difficult as we might suppose. Many times it does not much matter what we believe. We are free to remain in doubt. And we are well advised to remain in doubt, by virtue of the fallibility of all modern nondiscursive processes. In the cases from the life of Spurgeon, the congregation gets an illustration of the general lesson that all the assembled people are being addressed by God concerning their particular needs and sins. If Spurgeon is right and there is a young man with stolen gloves, the young man knows it and gets addressed very particularly. If Spurgeon is wrong (which he may be in his fallibility), there is no one who is so addressed, but the general lesson for the whole congregation remains. So if he is right, the people are helped and if he is wrong, it was at least a nice story. But just think of the negative ramifications of being wrong. When we pray, it doesn’t end there. We pray for Bob to be saved and hope people will be prompted to give him the gospel. We pray for Sarah’s recovery and expect people to visit her. And, to use Poythress’s example, if we pray for the church in Shanghai that is struggling, we hope it doesn’t end there either. Suppose three widows come up to you after the service and have checks written out to help them in their peril. Now is it as easy to say: “Well, I could be wrong”? This is exactly how so many of the prosperity preachers rake in the dough. “Kojo and his wife will have twins this year!” If he’s wrong, the people were entertained. If he’s right, his bank account gets bigger. In actuality we are accustomed in many types of situations to respond to doubtful information. After all, a long-distance call is not infallible either. There may be static on the line. The person on the other end of the line may have misunderstood the situation in Shanghai. Or he may be lying about the situation. Or he may have gone insane. Or the voice we hear may be faked by an impersonator. In spite of these problems of fallibility, it is possible to respond properly to a long-distance call. This is exactly the point. The man in Shangai, say, is asking for $10k to help his church under fire. But if there is static on the line or questions about his character, sanity and identity, then we do not move ahead. Our confidence is proportional to the information that we have. This is called wisdom and discernment. All information is vetted, and doubtful information all the more. And since all revelation in the dream, prophecy, tongues category belong in the latter department, is Poythress willing to vet all such revelation to the furthest degree? Is he willing to call the person in error a liar? A false prophet? Poythress suggests that Gaffin (cessationist) and Grudem (continuationist) are not that far apart, but after reading this article, I remain unconvinced. Two runny noses. Over 40 years, this is the only sickness the author has had and he expects the same for you. American pastor and evangelist Andrew Wommack wrote God Wants You Well in hopes of persuading people it is never God’s will for Christians to be sick. One of his basic arguments is that if Jesus and the early believers needed miracles, signs, and wonders to confirm God message, then we do too, and it is the height of arrogance to deny this (7). After all, one of the primary reasons Jesus came was to cure the body on earth. On the cross, Jesus suffered for our physical healing. “Jesus took our diseases just as much as He took our sins” (1). Wommack knows and aggressively opposes the arguments that contest him. In response to the claim, “[God is] putting sickness on you to teach you a lesson”, Wommack proclaims: “That’s absolutely untrue!” (11) Like all false teaching, there are some kernels of truth in this book. For example, it is correct that Jesus healed the lame man in Mark 2 “so that people would know that He also had power on earth to forgive sins” (4). But it is false to conclude from this passage that is always God’s will to heal believers today. This work is littered with errors. I have divided them into three categories below.